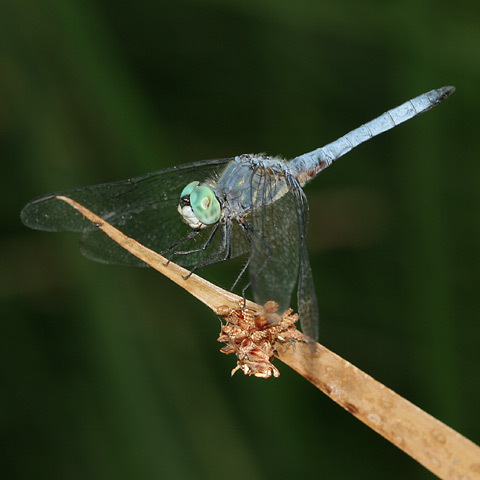 Blue Dashers (Pachydiplax longipennis) are large dragonflies found in wetland areas throughout Arizona. The males are a brilliant blue color with turquoise eyes, while the females are a yellowish brown color with red-brown eyes. The large, blue males are quite similar to male Western Pondhawks (Erythemis collocata), but Blue Dashers can be identified by their distinctive white face. 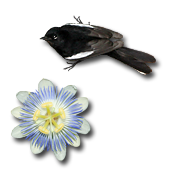 Blue Dashers often rest with their wings held forward, as shown in the above photograph. This dragonfly allowed me to get quite close, but each time I moved closer, it would move its wings to the horizontal position in preparation for possible flight. After I remained still for a moment or so, the dragonfly would relax its wings back again to the forward resting position. I spotted this Blue Dasher at Tucson's Sweetwater Wetlands, one of the best places to see dragonflies here in the desert. In their relentless hunt for flying insects, dragonflies can also sometimes be seen flying back and forth over swimming pools here as well.